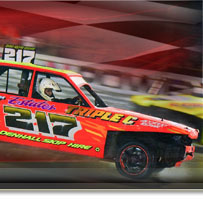 We have Hospitality Suites for Hire at the majority of our meetings at Foxhall Stadium, Ipswich. Each Suite will house 20 people in cordial surroundings furnished with a Fridge, Chairs and a Table as well as the Balconies providing unparralled panoramic views of the Racing. Book now to avoid dissapointment and treat your Guests, Employess, Family or Team to a Race Meeting with luxury - Childrens Birthday Parties catered for too! - at Spedeworth Motorsports Premier Race Facility.